Neil Gaiman and Chris Riddell are like the Tim Burton and Johnny Depp of the literary world. Everything they produce is wonderfully weird and a tad creepy, and The Sleeper and the Spindle is no different. Now I'll admit the main reason I picked this up is that stunning cover, which the picture above does no real justice. Seriously if you find this book in your local bookstore just pick it up and try not to buy it. I dare you. 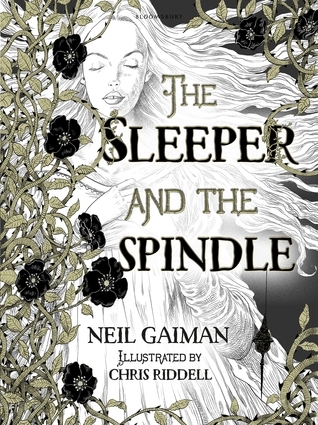 Gaiman's prose is lovely and peculiar, and accompanied by Riddell's illustrations the entire story comes to life; reading this was like going back to my childhood and reading the fairy tales I read then, each one beautifully illustrated with stunning princesses and ghastly crones. The plot itself I loved. I don't think it spoils anything if I say the main protagonist of this tale is Snow White, and it was great to see a Snow White who'd already defeated her stepmother, a Snow White who was already Queen and whose people were in need of her help. Having said that, I guessed what was coming at the end which is the main reason I didn't give this story a full 5 stars. I was hoping to be completely surprised as so many other readers had mentioned the big twist at the end, but it wasn't quite twisty enough. I still thoroughly enjoyed the read, though. If you're a lover of fairy tales then this is a must read for you, and even though the story is included in Gaiman's latest short story collection, Trigger Warning, I highly recommend getting your hands on this gorgeous illustrated edition. If you're looking for an LGBT fairy tale, however, you will be disappointed. I've seen quite a few people describing this as an LGBT retelling and it's really not, so if that's the main reason you want to check this story out I'm afraid it won't meet your expectations. But as I said this is a beautiful story, and I'm so glad to have this beautiful book on my shelf.